Here at Resmar we have researched extensively to bring you what we consider the best height safety kits available on the market today. 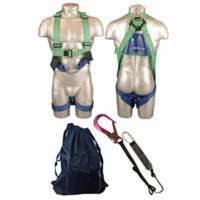 Ridgegear and Abtech are both companies that are renowned the world over for the quality and reliability of their range of premier class height safety kits. Industrial Safety Kits There are 2 products. We have selected five kits that we feel are the best in their class offering the highest performance and value for money, for different working at height environments. From Ridgegear we have the excellent K2, K3 and K4 height safety kits and from Abtech we have the height safety kit 2 and scaffolders kit 2. They comply with, and often exceed, modern safety regulations and are fully certified and thoroughly field tested, used by professionals the world over in the most demanding situations and harshest of environments. Here is an at a glance view of the kits we have available, for more details click through to the individual product description and the manufacturers data sheets for in depth technical specifications. Our team of experts will be happy to advise you when it comes to choosing the ideal kit for your individual requirements. for climbers, confined space entry, scaffolders. Front and Rear 'D' Attachment Points, RGH2 front and rear D harness, RGL1 1.8m Lanyard, RGK11 Karabiner, EN361/354 & 355, Water Resistant, ultra lightweight, tough, reliable. 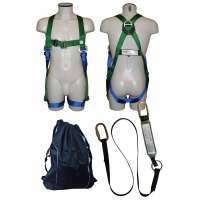 For scaffolders; RGH2 front and rear 'D' harness, RGL1 Lanyard, RGK11 lightweight Karabiner, RGK26/1 Anchorage sling , RGA1 fall arrest block (2.5m) rip stitch indicators, EN361, 354, 355 & 360.